The 2010 March Daring Baker’s challenge was hosted by Jennifer of Chocolate Shavings. She chose Orange Tian as the challenge for this month, a dessert based on a recipe from Alain Ducasse’s Cooking School in Paris. What is a tian, you ask? Yeah, I had to ask that too. I had never heard of a tian before. Apparently it's as simple as any layered dish. So a 7-layer bean dip is considered a tian just as much as the orange pastry you see above is. 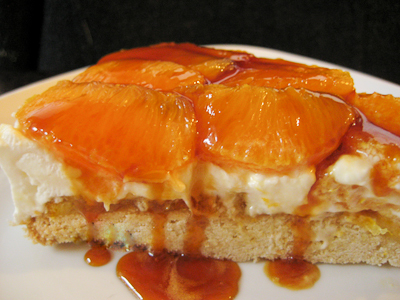 In this case, the orange tian is a layered dessert consisting of a sweet tart dough base, topped with orange marmalade, an orange flavored whipped cream, and then fresh orange segments, garnished with a luscious orange caramel sauce on top. While this recipe was fairly straightforward, I did get to learn several new techniques through this challenge. To start off, I made my very first marmalade. I love orange marmalade and could eat it plain by the spoonful. In fact, that's what I did with a few spoonfuls of this homemade goodness! In making the marmalade, I also learned how to extract my own pectin from orange seeds! I somehow forgot to put pectin on my grocery list and by the time I started making this recipe, there was no way I was going back out to get it. So, I checked out the forum and found another baker had suggested extracting your own. You basically just stick the seeds in a piece of cheesecloth, let it soak in some warm water for a few hours, and then squeeze the living daylights out of the cheesecloth and seeds until you get some gloopy goodness that is pectin. So cool. Beautiful layer of orange marmalade atop the pate sablee. I also learned how to segment an orange during this process. As simple as it is, I had never done this before. The youtube video that was linked was a great tutorial and I had all eight oranges segmented in no time. This is definitely my preferred way to eat a grapefruit from now on (I used to always just slice it in half and then dig in with a spoon!). Instead of making mini desserts with cookie cutters, I opted to make one large tart using my springform pan. I simply cut out a piece of parchment that would fit into my pan and then used that as a guide as I rolled out the dough. This dessert is perfect for spring or summer. It would be great for entertaining, as you could get all of the components together ahead of time and then just assembled it right before the party. Even simpler if you used store bought marmalade or jam. 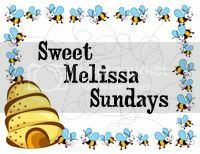 I loved this dessert, especially with the orange caramel sauce on top! I've never had anything like it. My husband isn't a huge fan of citrus, but did think that this would be even better with raspberry jam on the bottom and fresh raspberries on top! I think the different flavor combinations are endless. Thanks Jennifer, for hosting this month's challenge. 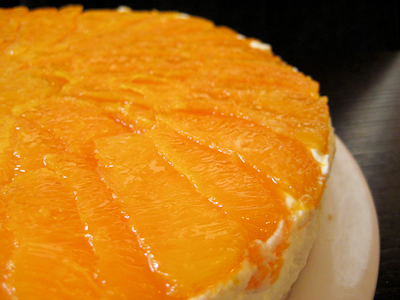 Make sure you check out the Daring Bakers' Blogroll to see how everyone else enjoyed this citrus-y treat. Put the flour, baking powder, ice cold cubed butter and salt in a food processor fitted with a steel blade. In a separate bowl, add the eggs yolks, vanilla extract and sugar and beat with a whisk until the mixture is pale. Pour the egg mixture in the food processor. Process until the dough just comes together. If you find that the dough is still a little too crumbly to come together, add a couple drops of water and process again to form a homogenous ball of dough. Form into a disc, cover with plastic wrap and leave to rest in the fridge for 30 minutes. Preheat your oven to 350 degree Fahrenheit. Finely slice the orange. Place the orange slices in a medium-sized pot filled with cold water. Simmer for about 10 minutes, discard the water, re-fill with cold water and blanch the oranges for another 10 minutes. Blanch the orange slices 3 times. This process removes the bitterness from the orange peel, so it is essential to use a new batch of cold water every time when you blanch the slices. Once blanched 3 times, drain the slices and let them cool. Once they are cool enough to handle, finely mince them (using a knife or a food processor). Weigh the slices and use the same amount of granulated sugar . If you don’t have a scale, you can place the slices in a cup measurer and use the same amount of sugar. In a pot over medium heat, add the minced orange slices, the sugar you just weighed, the orange juice and the pectin. Cook until the mixture reaches a jam consistency (10-15 minutes). Transfer to a bowl, cover with plastic wrap and put in the fridge. For this step you will need 8 oranges. Cut the oranges into segments over a shallow bowl and make sure to keep the juice. Add the segments to the bowl with the juice. Once the sugar starts to bubble and foam, slowly add the orange juice. (At this point, the caramel will harden... just keep heating and stirring and it will dissolve back into solution.) As soon as the mixture starts boiling, remove from the heat and pour half of the mixture over the orange segments. In a small bowl, add the gelatine and hot water, stirring well until the gelatine dissolves. Let the gelatine cool to room temperature while you make the whipped cream. Combine the cream in a chilled mixing bowl. Whip the cream using a hand mixer on low speed until the cream starts to thicken for about one minute. Add the confectioner sugar. Increase the speed to medium-high. Whip the cream until the beaters leave visible (but not lasting) trails in the cream, then add the cooled gelatine slowly while beating continuously. Continue whipping until the cream is light and fluffy and forms soft peaks. Transfer the whipped cream to a bowl and fold in the orange marmalade. Make sure you have some room in your freezer. Ideally, you should be able to fit a small baking sheet or tray of desserts to set in the freezer. Line a small tray or baking sheet with parchment paper or a silicone sheet. Lay out 6 cookie cutters onto the parchment paper/silicone. Drain the orange segments on a kitchen towel. Have the marmalade, whipped cream and baked circles of dough ready to use. Arrange the orange segments at the bottom of each cookie cutter. Make sure the segments all touch either and that there are no gaps. Make sure they fit snuggly and look pretty as they will end up being the top of the dessert. Arrange them as you would sliced apples when making an apple tart. Once you have neatly arranged one layer of orange segments at the bottom of each cookie cutter, add a couple spoonfuls of whipped cream and gently spread it so that it fills the cookie cutter in an even layer. Leave about 1/4 inch at the top so there is room for dough circle. 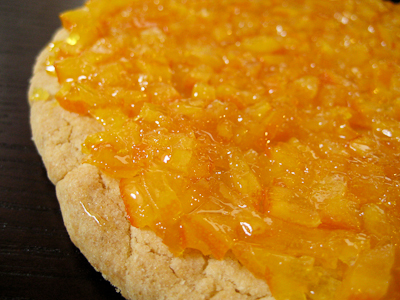 Using a butter knife or small spoon, spread a small even layer of orange marmalade on each circle of dough. Carefully place a circle of dough over each ring (the side of dough covered in marmalade should be the side touching the whipping cream). Gently press on the circle of dough to make sure the dessert is compact. Place the desserts to set in the freezer to set for 10 minutes. Using a small knife, gently go around the edges of the cookie cutter to make sure the dessert will be easy to unmold. Gently place your serving plate on top of a dessert (on top of the circle of dough) and turn the plate over. Gently remove the cookie cutter, add a spoonful of caramel sauce and serve immediately. Your tian looks absolutely gorgeous. 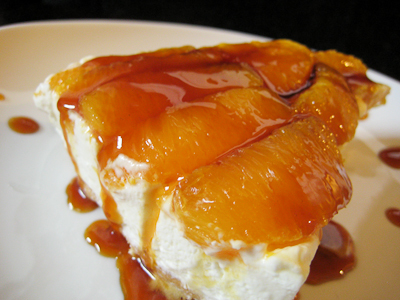 I love all that caramel sauce on top! I love oranges. LOVE them. This just...I can't even describe how good this looks! I didn't know what a tian was either so I'm glad you mentioned that! This dessert sounds amazing and I absolutely love the way it looks with the orange segments on top. Great job! Great job on your tian! Your photos, as always, are just gorgeous!! Your tian is very well made! Good job! sounds like this creation was quite an education for ya! i actually had no idea one could produce her own pectin, so that's good to know. your final product looks elegant and delicious, jaime--nicely done! Its really very pretty how the orange slices appear layered on top of your Tian. This is nothing short of torture!!! 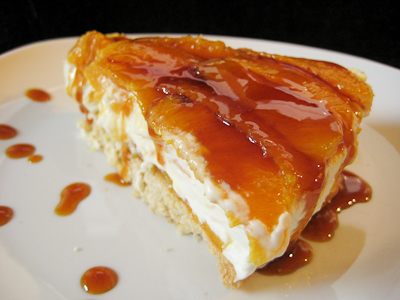 Caramel, orange, cheese, cream...gosh I can just imagine the delight! Wonderful job on the challenge. I didn't know about making your own pectin. I'm with Grace. An elegant and delicious dream come true. I've never made my own marmalade. I have a feeling I'd be tasting and baking as I went along too! Thanks for sharing, Jamie...GREAT job!!! Wow, that caramel is so rich looking! Mine didn't turn out at ALL...it was more like a simple syrup. Oh well! I was glad to know how to segment as well, though one of my favorite parts about eating an orange is pulling the segments apart! This orange tian looks great. Thanks for baking and sharing. Very refreshing for the summer time.